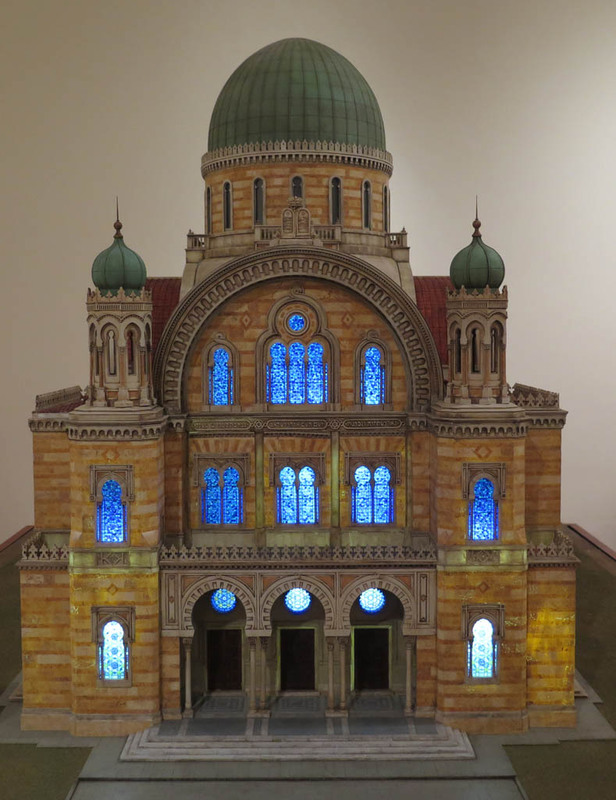 When New York’s Yeshiva University Museum first opened its doors in April 1973, its core collection consisted of a series of ceremonial objects recovered from Nazi Europe and a striking collection of ten accurately rendered, intricately detailed scale models of historic synagogues. 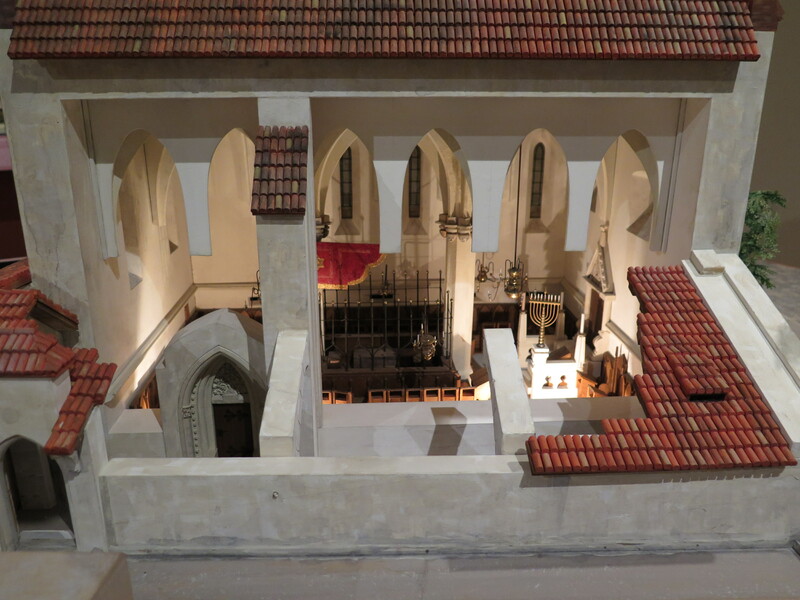 The models were specially commissioned by the museum in conjunction with its founding and constructed entirely by hand. Now, for the first time in nearly three decades, all ten models are once more on display. 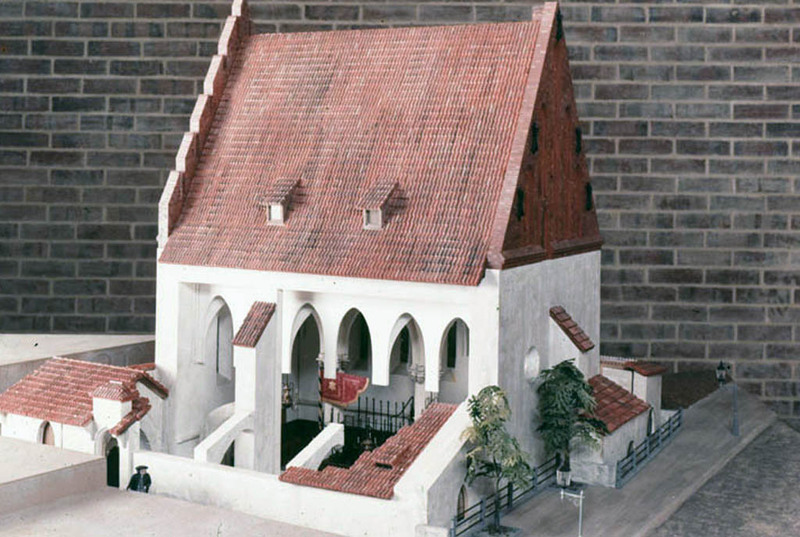 From the Dura-Europos synagogue in 3rd-century Syria to the 18th-century Touro synagogue in Newport, Rhode Island, and Tempio Israelitico in 19th-century Florence, the models reflect the geographic and cultural range of the Jewish world throughout history and represent a dramatically diverse array of architectural styles. Each synagogue embodies aspects of its respective culture, time and place, yet also illustrates key practices and ideas that have resonance in synagogues and Jewish communal life across centuries and continents. The synagogues selected for the exhibition were chosen for their historical and architectural significance. Also important was the quality and availability of documentation essential to producing archaeologically and historically accurate reconstructions. In addition, the buildings had to exhibit what Yeshiva University professor and scholar of Jewish art Rachel Wischnitzer, a co-director of the project, called “a unifying idea”—a significant symbolic feature or specific architectural characteristic that distinguished that synagogue. The models were created from 1970-1973 by Displaycraft, a model-making and exhibition-design company based in New York, with the aid of archival photographs, archaeological records, site measurements and firsthand descriptions of the structures. No computers were employed. The models are accompanied by an impressive array of original objects associated with each synagogue, including a bronze incense shovel from the era of the Second Temple that has links to the decorations in the Beth Alpha Synagogue; a Torah scroll used in Amsterdam’s Spanish-Portuguese Synagogue, which may date from before the time of the expulsion of Jews from Spain; and a large-scale brass Hanukkah lamp and silver Torah shield that echo the furnishings of the 17th-century Zabludow Synagogue in Poland. 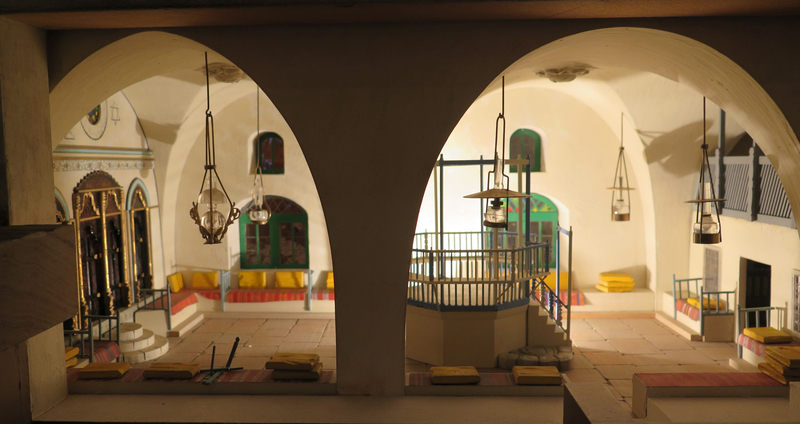 Other artifacts, drawings, paintings, manuscripts, photographs and maps from the communities represented by the models bring to life the cultures that produced these synagogues and the thematic elements that connect them. Also on view are plans, photographs and correspondence documenting the commission of the models. The earliest of the synagogues represented in the exhibition, Dura-Europos was excavated in 1932 by American and French archaeologists. 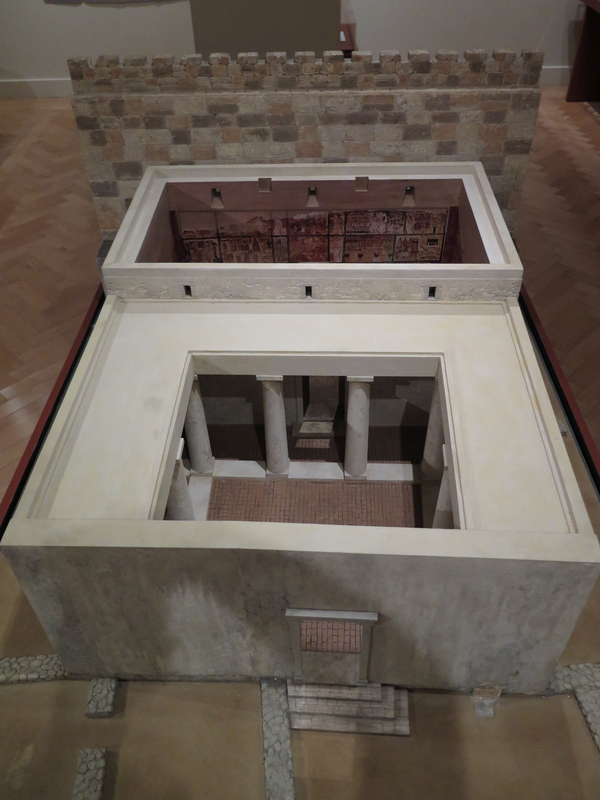 The model shows the synagogue as it was believed to have appeared in 244-245 CE, when it underwent a major renovation, and in 256 CE, when the town of Dura-Europos was sacked by the Persians. Dura-Europos is the earliest extant synagogue with narrative biblical wall paintings and thus has provided great insight into the art of late antiquity. The building was part of a housing complex refurbished for use as a synagogue through the addition of benches and a Torah shrine on the western wall. Such “house synagogues” were a common practice in the Greco-Roman world for Christians and other religious organizations as well. When an irrigation channel was dug for a kibbutz in the Jezreel Valley of the Lower Galilee in 1928, workers exposed the foundations and mosaic pavement of the 6th-century Beth Alpha Synagogue. The site was subsequently excavated by a team from Hebrew University and later, in the 1960s, by the Israel Antiquities Authority. 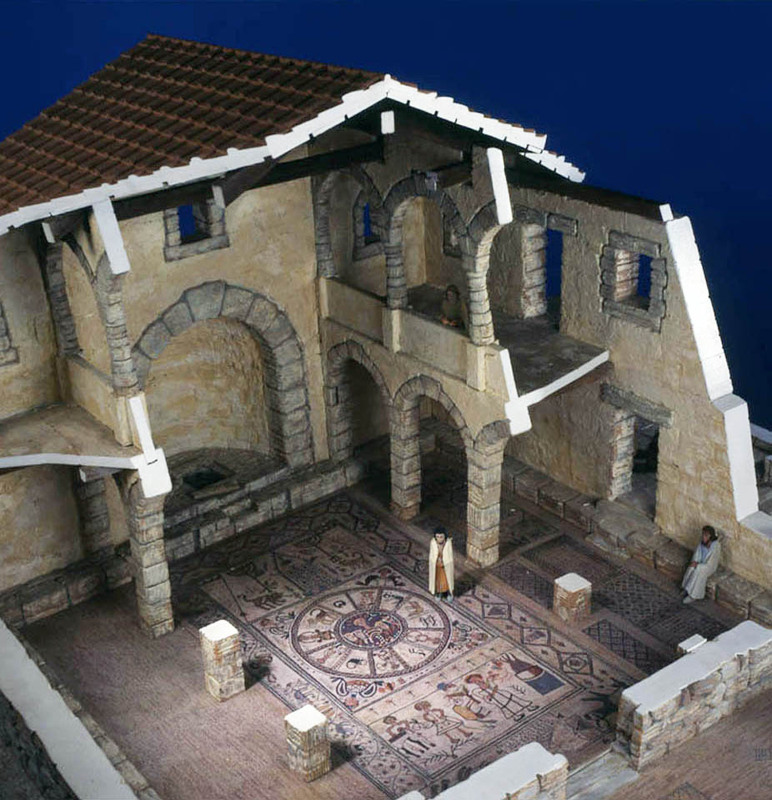 The model, based on plans published by archaeologist Eleazar Lipa Sukenik, head of the Hebrew University team, depicts the second stage of the synagogue, which was built in the style of a late-antique basilica. The structure is renowned for its expansive mosaic floor, which includes scenes of the binding of Isaac, the zodiac and a Torah shrine flanked by two menorahs. The model incorporates a scaled photograph of the mosaic. Completed in 1270, the Altneuschul (“Old-New Synagogue”) in Prague is the oldest still-active synagogue in Europe. It was constructed in the Gothic style, with twin naves modeled on a German building type. The woman’s gallery was designed with slatted windows, which allowed women to follow the service in the main hall. 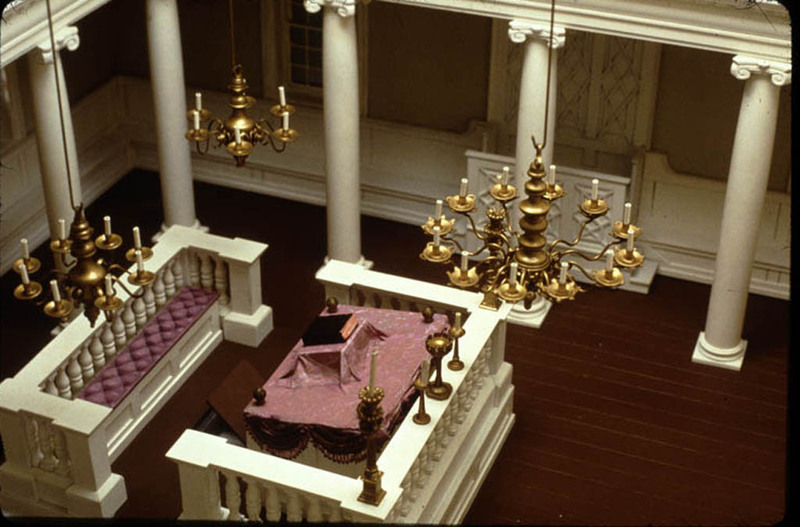 The central bimah, or reading platform, was a common feature of Ashkenazi synagogues. 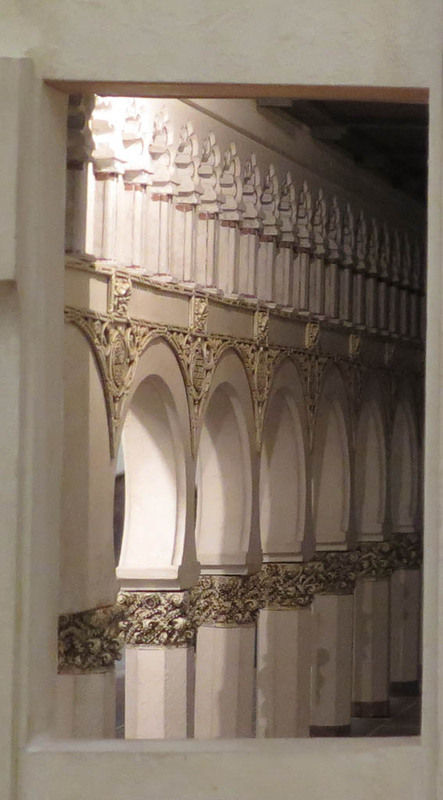 By “opening up” the south wall of the synagogue, the model makers provided a clear view into the sanctuary, revealing the system of arched stone buttresses that provided structural support from outside the building. According to local legend, the Altneuschul was built with stones transported by angels to Prague from Jerusalem’s destroyed Second Temple. Altneuschul means Old-New Synagogue in both Yiddish and German, but it also suggests the Hebrew phrase al tnai, “on condition”—the condition being that the synagogue’s stones would be returned and reintegrated into the Temple when it was rebuilt. Another legend compares the synagogue’s two central columns to Boaz and Yachin, the names given to the pillars at the entrance to the First Temple. Commonly known as the Congregational Synagogue of Toledo, the Synagogue of Santa Maria la Blanco combines Moorish and Romanesque elements in its richly decorated interior. A series of octagonal piers, topped with capitals adorned with pine-cone motifs, support horseshoe arches typical of the Mudejar style, which skillfully blended Arabic and Spanish artistic elements. One of many Jewish houses of worship built during the 13th century under the sympathetic rule of the Christian kings of Castile, the synagogue is an excellent example of both the style and disastrous fate of Spain’s Mudejar synagogues. Beginning in the 14th century, waves of persecution resulted in many of these synagogues being destroyed or taken over by the Catholic Church. La Blanca was stripped of its Judaic elements in the early 15th century and converted into the convent and church of Santa Maria la Blanca. In 1851, the La Blanca Synagogue was declared a national monument by the Spanish government. Owned by the Catholic Church, it is preserved as a museum. In the 17th century, Amsterdam became a haven for conversos (Spanish and Portuguese Jews forced to convert to Christianity) fleeing their homes on the Iberian Peninsula. The community prospered and in 1661 the foundation was laid for an impressive synagogue. The Dutch Republic’s war with France, however, delayed construction, so the building wasn’t completed until August 1675. The synagogue, which featured 2,000 seats, a Torah Ark and a bimah made from rare Brazilian jacaranda wood, served as the model for Sephardic synagogues throughout the world. The structure incorporated several unique features. The Tablets of the Law were, for the first time, set up at the top of the Torah Ark in the main sanctuary and the rear buttresses were designed to evoke the Temple of Jerusalem. The interior of the structure is typically Sephardic, with the bimah located toward the rear of the Hall, opposite the Torah Ark. In the 1500s, Safed, located in Israel’s Galilee and home to a community of Jewish mystics, became the center of the Kabbalistic movement. The mystics, many of whom came to Safed following the expulsion of Jews from Spain, propelled Kabbalistic doctrine and practice toward a more fervent messianic focus. At least two synagogues in Safed are dedicated to Rabbi Isaac Luria, who is recognized as the father of modern-day Kabbalah. The older of the two, originally dedicated to the Elijah the Prophet, is the one on which this model is based. It is known as the Sephardic Ari Synagogue. The design of the building reflects several sources. The heavy stone architecture and buttresses echo the appearance of early Crusader buildings in Israel. The interior, with its single long hall, three vaulted bays, fore courtyard and arrangement of seats along the walls, is typical of Ottoman architecture in Israel and some Sephardic synagogues. A particularly Sephardic element is the tripartite Torah Ark (actually three arks) set on the southern wall facing toward Jerusalem. The city of Zabludow was an important Jewish center during the 17th century. The central body of authority for Polish Jewry, the Council of the Four Lands, met there in 1664 and 1667. At the time, wood construction was the principal form of synagogue architecture in Poland, Lithuania, Ukraine and Russia. 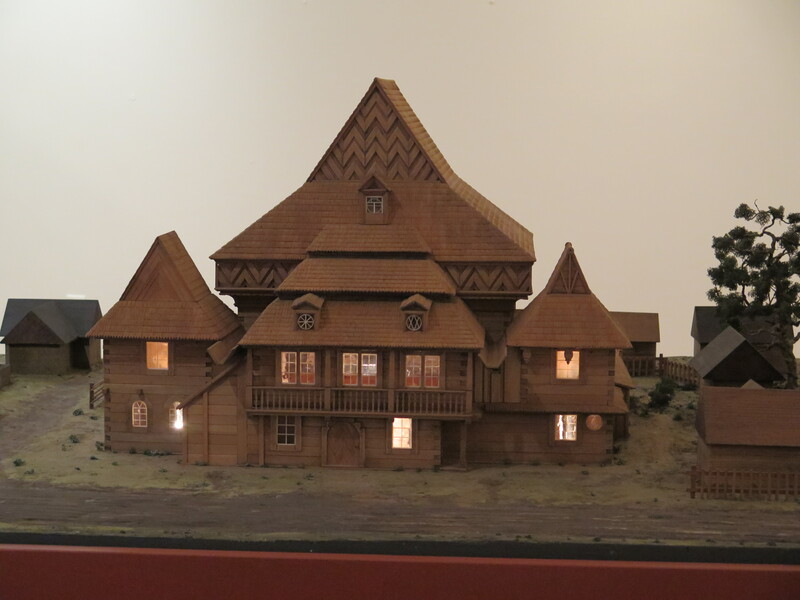 The Zabludow Synagogue was built in a way that resembled wooden churches and manor houses of the era. It began as a simple house of worship with side annexes and corner pavilions. In the 18th century, a room on the second story over the vestibule was added to provide additional women’s seating. The interior was decorated with floral and animal motifs. 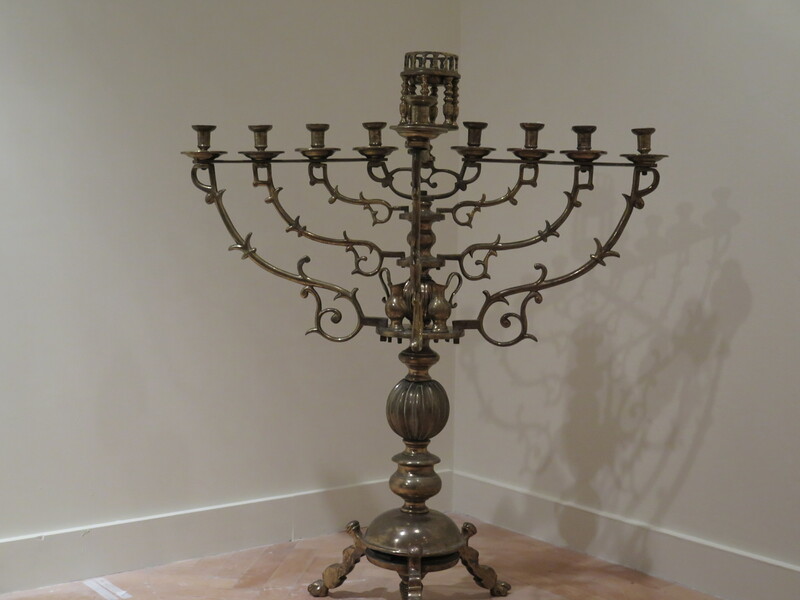 There is evidence that Hanukkah lights, or menorahs, similar to the one in the collection of the Yeshiva Museum included in the current exhibition, were used in the synagogue, which was destroyed during World War II. This model reflects the original conception of Peter Joseph Krahe, a prominent regional architect, who created architectural plans for the building in 1789. For reasons unknown, the local Jewish community brought in another architect, Peter Koehler, who simplified Krahe’s plans. 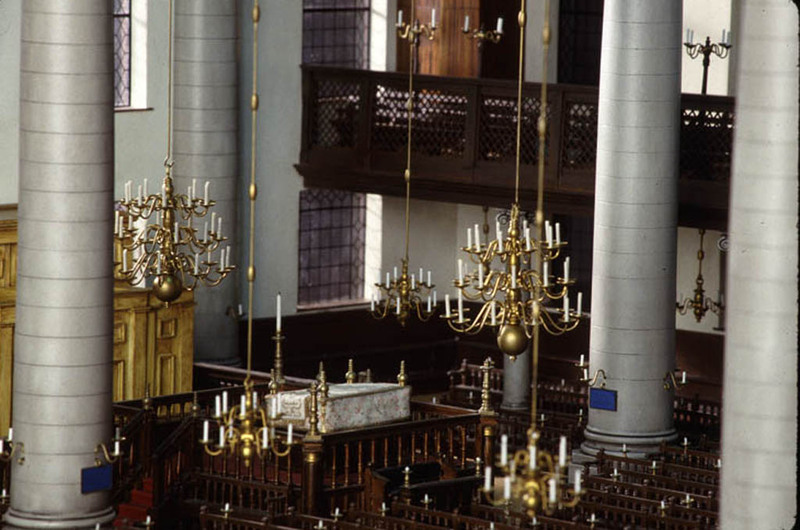 The Dusseldorf synagogue was part of a Jewish communal compound containing a school and living quarters for the rabbi, cantor and other communal members. The structure’s three-tiered galleries were innovative, making it one of the earliest galleried synagogues in Germany. The additional levels were likely the result of the increasing number of female worshippers, the growth of the local burial society, the needs of Jewish communal organizations, and the possible existence of a children’s choir. The building was torn down in the 1870s to make way for a larger synagogue, which was built in a neo-Moorish style and completed in 1875. Designed by Vincente Micheli, Marco Treves and Mariano Falcini and dedicated in 1882, this monumental synagogue celebrated the new status of Florentine Jews following their emancipation in 1848 and the abolishment of the Jewish ghetto. The core design is that of a domed Greek cross, with galleries in the cross arms and towers bordering the façade. It was rendered in the then-popular Moorish style, with domes and horseshoe arches, carpet-like polychrome surface decorations and a facade composed of alternating courses of tan travertine and red granite. Its interior was modeled on southern European Ashkenazi synagogues, which featured a centrally located bimah. The building was restored after incurring serious damage during World War II and then again in 1966 after the Arno River dramatically overflowed. “Modeling the Synagogue—from Dura to Touro” is on view at the Yeshiva University Museum at 15 West 16th Street in New York City through December 27, 2015. All images courtesy of the Yeshiva University Museum.